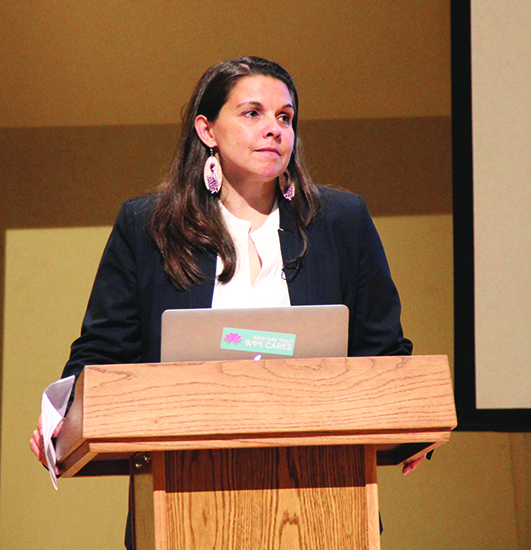 Dr Stephanie Fryberg spoke about building on the strengths of Native students at her lecture held in Kane Hall, on the UW campus. The way we learn is shaped by our culture. For indigenous children, there is often a mismatch between their culture and the classroom. This has been a long held belief in the Native community. For Tulalip tribal member and associate professor Stephanie Fryberg, Ph.D., she had the unique access to resources and methodology necessary to examine how indigenous children’s approach to learning and how the teaching model of their educators can coalesce to create a more supportive academic environment. Dr. Fryberg shared her findings during a lecture held at the University of Washington on Wednesday, April 20. Dr. Fryberg’s lecture was part of the Connecting the Dots Between Research and Community series, where a UW Psychology professor partners with a visiting colleague to tell the story of how their research is addressing some of society’s biggest challenges. Presented by the UW Department of Psychology and the UWAA, this event was free and open to the public. In attendance to support their fellow Tulalip tribal member were Senator John McCoy, General Manager Misty Napeahi, and Board of Director Glen Gobin. Dr. Fryberg’s lecture was titled Using Cultural Models to Build on the Strengths of Native Students. The description is as follows: Individuals are a product of the culture they inhabit, and also play an important role in creating and adapting to that culture. For many indigenous students, the culture of educational institutions in the U.S. reflects a set of ideas and practices about what it means to be a “good” student, the purpose of education and the nature of the relationship between teachers and students. This results in a cultural mismatch between indigenous students’ model of self and the model prevalent in mainstream educational contexts. A central theme to the lecture was an examination of the “struggling Native student” narrative. We’ve all heard about this narrative and probably seen the statistics that are often used to defend it. Taking it up another notch, we’ve also heard that even when Native students do manage to graduate high school, they are not adequately prepared to achieve success in higher education. Dr. Fryberg attributes this narrative to being one of a cultural context and to alleviate the narrative we must reframe the idea altogether. “We are going to reframe this idea of the struggling Native student by looking at it through a bigger picture, which we in my field refer to as the cultural cycle,” stated Dr. Fryberg. “The culture cycle reminds us that to truly alleviate the achievement gap we have to start by looking at every piece of the culture cycle. So when we think about a child in a classroom, it isn’t just about the child and the teacher, it’s about so much more. It’s about the ideas that stand behind why children go to school, it’s the ideas that lead to the development of the school, or that set the stage for what we see as the ‘good’ or ‘right’ way to be a student. Within the cultural cycle it is critical to be aware of two distinct cultural models of self, the independent model and the interdependent model, that play major roles in how the shaping of interactions between student and teacher effect student development and achievement outcomes. The independent model of self is based on an understanding of self as independent from others and the social context. “Good” actions promote separation from others and individual self-expression. The independent model of self is best seen in the U.S. mainstream, where context is driven by a set of cultural norms, values and beliefs that center the individual as independent and separate from others. It is a unique cultural model that most of the world does not engage in. In many parts of the world that notion to separate yourself from others is not only unheard of, but would be seen as unhealthy. A much more common model is the interdependent model of self that is based on an understanding of self as interdependent with others and the social context. “Good” actions promote connection to others and attention to others’ preferences. Most people and cultures in the world, specifically outside of the U.S., engage in this more interdependent model. It’s important to recognize that Native culture is inherently within the interdependent model, but because we are within the U.S. our actions, values, and norms are constantly scrutinized by the mainstream independent model. Now, you may be wondering how all these concepts and social psychology terms tie-in with Native students, their teachers and academic success. It does all come together. By recognizing Native students’ engagement in the interdependent model of self, but that in large part their teachers and schools adhere to the independent model of self, we can then understand how the prevailing education system is not setup for Native student to succeed. However, there are courses of action to change this, which Dr. Fryberg and her team demonstrated at Quil Ceda Tulalip Elementary from 2011-2014. Using the culture cycle to enhance academic performance by Native students alleviates the “struggling Native student” narrative by requiring culturally-grounded interventions that focus on all levels of the cultural cycle. This work is achieved by building schools that reflect and foster a diversity of viable ways of being; creating an immersion environment (e.g., morning welcome assembly, growth mindset, purposefully placing posters/images on walls); creating “matches” by helping Native students build identities that maximize potential while also providing them with a culturally-safe educational atmosphere; and by valuing old identities and scaffolding new identities. In the study done at Quil Ceda Tulalip Elementary from 2011-2014 by Dr. Fryberg and her team, with the inclusion of the previously listed methods and intervention, the results were staggeringly in favor of increased Native student achievement. Kindergarten and 1st graders led the district in oral reading fluency; 95% of Kindergarten and 80% of 1st graders were proficient or above benchmark in reading. Using measures of academic progress in literacy and math for grades 3-5, 60% made more than one year’s growth and at least half of these students made 1.5 to 2 years growth. Best of all, the school met state annual measurable objectives in every category. It’s important to note that having teachers who are aware of their own biases towards the independent model of self and willing to retrain and reframe their teaching methods to suit their Native students is central to overall success as well. It’s a cycle of understanding and legitimizing the learning and cultural model of Native children that leads to them making greater strides in academic development and achievement. When this occurs not only do the expected outcomes of the students and their teacher benefit greatly, but the entire community as well. This entry was posted in News, Top Story, Tulalip News and tagged culture, education, Indigenous Children, learning, Native American, students, Tulalip by Kim Kalliber. Bookmark the permalink.